About | Photos | Contact | fr. What if Boris Vian had written ‘Froth on the Daydream’ nowadays, would Colin have created in his Parisian flat the now famous pianococktail? We’ll never know. However, it’s following this spririt that Data Cocktail was imagined. 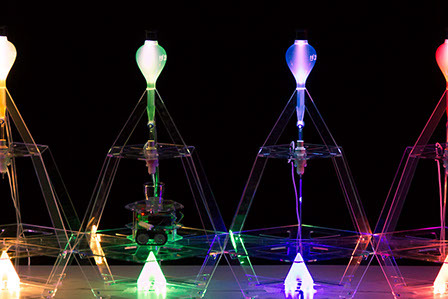 If the curious instrument described by Boris Vian allows the transmutation of a jazz tune into a drink, Data cocktail translates in a tasty way the Twitter activity. When a cocktail is desired, the machine will look for the five latest messages around the world quoting one of the available ingredients. These messages will define the drink composition. 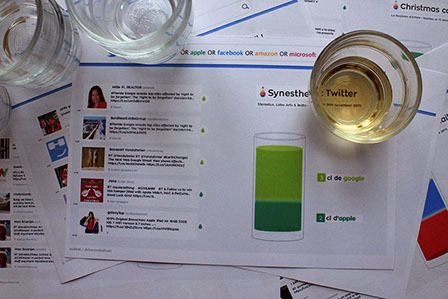 Data Cocktail not only provides a unique kind of drink, but it also prints the cocktail’s recipe along with the corresponding tweets. A gift you can take away. 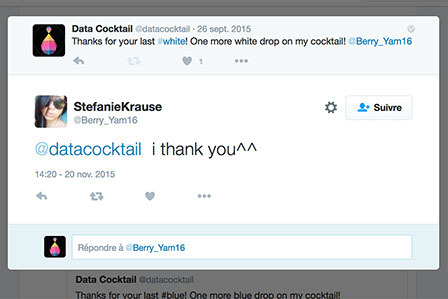 If you’re wondering whether a tweet about Santa Claus in Winnipeg in Canada can take part in generating a cocktail in Nantes, we say yes! Data Cocktail is a machine but it doesn’t exclude a minimum of politeness. Once the cocktail mix is realized, Data Cocktail will thank the tweeters who have, without knowing it, helped at realizing it.